Many People understand that there is a high tide and a low tide but few know what actually causes these tides and that there are different patterns of tides and tide cycles. 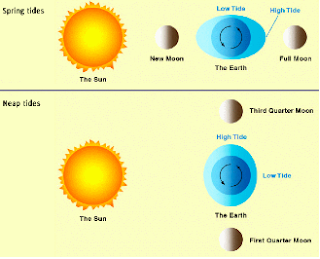 There are two main forces that causes tides: the first is the gravitational forces of the Moon and Sun acting on the Earth; the second is the inertial (centrifugal) force due to the Earth's rotation about the center of gravity of the Earth moon system. The Moon's rotation around the Earth combined with the Earth's own rotation causes the ocean's water to bulge in the direction of the Moon. This is called the Equilibrium Tide Theory; the Moon's gravity causes a bulge on the facing side of Earth, and the centrifugal force causes a bulge on the opposite side of Earth. (2) The Sun has a gravitational pull on the Earth, which coincides with the pull of the water surface towards the Sun. The Sun has a smaller effect on tides because its distance from the Earth is that much greater than that of the Earth and Moon. The cycle between a high tide and a low tide is roughly 13 hours. High tide and low tides occur approximately one hour later each day because as the Earth completes one rotation, the Moon has progressed 12 degrees along its orbit around Earth in the same direction. (1) So high and low tides are directly related to the position of the Moon relative to the Earth. The two different types tide cycles are neap tides and spring tides. These are explained by the positions of the Sun and the Moon relative to the Earth and the corresponding affect on the tides. (See Illustration) A spring tide is when the Sun and the Moon align themselves with the Earth. (2) This increases the gravitational force acted on the oceans and increases the amount that the tides rise and fall. A neap tide is when the Sun and Moon align themselves in a 90-degree angle relative to the Earth and more equally distribute their gravitational pull on the oceans. (2) The time between a spring tide and a neap tide lasts about seven days. There are three different types of tide patterns: diurnal, semidiurnal, and semidiurnal mixed tides. (2) What makes these tide patterns is how many times a high tide and low tide occur during one day and the level that those tides reach. A diurnal tide is when there is one cycle between high tide and low tide during the day with a moderate change in water level. This occurs when the Moon is aligned with either the North or South Pole. A semidiurnal tide pattern is when there are two cycles of tides during one day with a moderate change in water level (two high tides and two low tides). This happens when the Moon is aligned with the equator. A semidiurnal mixed tide is when there are two cycles of tides in one day but the tides occur at different levels. This means that there is one elevated water level high tide and one moderate water level high tide along with one elevated water level low tide and one moderate water level low tide. Tides are also partially responsible for waves, erosion, currents, and animal migration and mating. (1) What makes them even more complicated and hard to predict is the relationship between where the ocean meets land and how fast the ocean floor drops away from the continental shelf. As you can see, there are many different factors that determine the dynamics of tides, the formation of tides, and who are effected by tides.